Throughout cultures, earlobes are used to enhance one’s beauty and appearance by wearing earrings or earlobe tunnels. Over time a piercing can stretch from wearing heavy jewellery, or in the case of intentional ear stretching, the stretching of the earlobe occurs as the size of the inside increases. On occasion, an earlobe can tear or, once the earlobe tunnel is removed a big hole is left with a sagging roll of skin. Both can lead to discomfort and self-consciousness, as well as the inability to wear earrings. 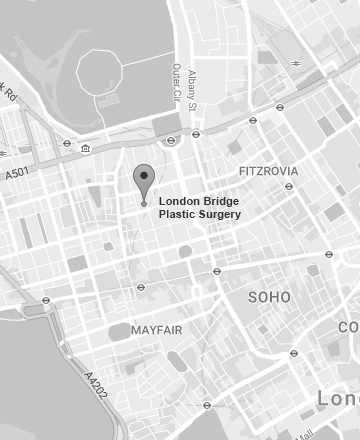 At London Bridge Plastic Surgery and Aesthetic Clinic, earlobe repair surgery can restore the original shape of your earlobes and make sure that your earlobes are in proportion to the rest of your face. Mr Bran, our specialist plastic surgeon who has two specialisations: Head and Neck Surgery and Facial Plastic Surgery, performs numerous complex reconstructions of the ears on a regular basis. He is here to help you. Am I suitable for Earlobe Repair Surgery? The Earlobe Repair Plastic Surgery is suitable for patients who have stretched and/or elongated earlobes from wearing earlobe tunnels or have torn their earlobe when wearing heavy jewellery. It can also be performed, when a patient is seeking to remove an existing piercing or feel that their earlobes are too large or long secondary to aging. What are the costs for Earlobe Repair Plastic Surgery? How is the Earlobe Repair Surgery performed? The Earlobe Repair Surgery is performed under local anaesthetic as an outpatient procedure. There are various surgical techniques, and the method is chosen based on your individual case. The earlobe is marked before a very small injection of local anaesthetic is injected into the earlobe. The tissue is then repositioned, or a long roll of overstretched skin is resected (cut away), after which fine sutures are placed to reconstruct the earlobe. A small tape dressing is applied and you are able to leave the clinic immediately after. Will there be any bruising or swelling following Earlobe Repair Surgery? As with all surgery, there is a risk of bruising and swelling but this is usually minor and will resolve in about 7 days. It is recommended that you take Arnica before and for 1 week after your earlobe lift surgery. How long is the recovery after Earlobe Repair Surgery? You will need to avoid vigorous activities for 1 week after your surgery. Do not dye your hair until the sutures are removed 6 days following your earlobe lift. You can shower the following morning after your surgery. You can return to an office job the day after your procedure. Can I wear earrings after Earlobe Repair Surgery? We advise our patients to stop wearing jewellery for a minimum of one week after surgery. In cases of a split earlobe, a new piercing will be required. Re-piercing should be performed 6 weeks after your Earlobe Repair Surgery and is part of your aftercare package. Mr Bran will be able to give you some recommendations about earring materials for piercing to reduce the chance of reoccurrence of a split earlobe.